Join us Friday, May 2 for a special Girls' Night Out. Grab your girlfriends and enjoy a complimentary signature cocktail from Ketel One Botanicals (while supplies last), shopping and the Famous Firefighter Fashion Show all under one roof! Admission is $5 After 5pm. Happy hour doesn't get any happier than this! Saturday, May 4 is Walgreens Day at the show. Each hour, someone is going to win a $25 Gift Card. 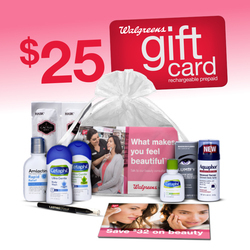 Plus, stop by the Walgreens exhibit space for a fantastic swag bag filled with beauty samples and valuable coupons. With Teacher Appreciation Week coming up, we decided to thank our educators on Saturday with Teachers Day! The fun starts at the box office with all teachers & school employees getting $5 door price admission (with valid school ID, Saturday only). That's a $7 savings! The first 100 teachers & school employees to come by the Show Office with valid school ID will receive a FREE Women’s Show Reusable Shopping Bag. Inside you’ll find a Triple Winning 7s instant game courtesy of the Michigan Lottery – you could win up to $50,000! Who better than your mom or daughter to spend a day together at the Michigan International Women’s Show? Sunday, May 5 is Mother Daughter Day! The fun starts at the front door with a special gift from Mackenzie's Sugar House (while supplies last) and then there’s lots of great shopping and prizes to win.